For Judaism beliefs about the afterlife are pretty fluid. Because Judaism focusses more on what one does with ones beliefs than on the beliefs themselves this subject was never given the same emphasis it was in some other religions. The Jewish attitude has traditionally been that what matters is what one does with the present moment. If one is Torah observant in this life the next life will take care of itself B"H. What practical benefit would be gained from understanding its specifics? Nonetheless, Rambam lists the belief in an afterlife, in the resurrection of the dead, as one of the thirteen beliefs all Jews should embrace. For many Jews that general belief is sufficient. For others it opens the door to many fascinating discussions. For some Jews today the idea sounds unscientific is no longer embraced. In this study we'll seek to understand what the Bible and our traditions say about the afterlife. In part because of assimilation and Judaism's lack of dogmatism about the details of the afterlife, the beliefs of other traditions have impacted Judaism to some degree. Certain Christian dogmas (like Heaven or Hell after death) are today accepted by some Jews in some, generally modified, forms. 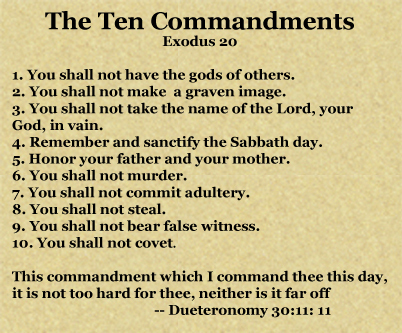 Understand however that Jews do not accept the Christian threat of eternal punishment in Hellfire by the G-d of Love. Certain segments of the Church continue to use this threat as a means to draw people into their religion but we do not. It behooves us to understand these matters from diverse perspectives. In this study therefore I will be sharing quotes from both the Jewish Tanach and the Christian New Testament because this subject impacts both groups directly. Among the Nicene Christian dogmas few are so deeply held as the belief in the place of eternal torment known as Hell or Hades. Throughout the centuries Nicean pastors and evangelists have hammered the ultimate damnation of the "lost" so thoroughly into the consciousness of the world that even questioning the dogma often meets with accusations of heresy! Apostasy! Some of their missionaries claim that Jesus spoke more about Hellfire and eternal damnation than any other topic! Hell fire has been a potent weapon for centuries. But its a lie and an insult against the G-d of Justice and Mercy. Today most people find the belief in Hell untenable for many reasons. Even most Christians shy away from it today, although most continue to give it lip service lest they be counted among the "heretics." Many more people today reject G-d out of hand, arguing that such a cruel tormentor is not worthy of worship even if He exists! This position is understandable. Fortunately this depiction of the G-d of the Torah is not accurate. First we need to understand that HaShem is not our enemy! He is our eternal well-wisher, our loving Parent. He is HaShem Rohi: G-d our Shepherd Who guides us through still pastures even as we pass through the valleys of the shadow of death (Psalm 23). HaShem is with us always. The biblically mandated "fear of the Lord" needs to be properly understood. Psalms 111:10 the first and foremost point of wisdom is the fear of HaShem; all those living by it gain good common sense. His praise stands forever. What is the fear of HaShem? Are we supposed to cower in fear that HaShem might do us some harm, that He might condemn us to eternal torment if we step out of line? G-d forbid even the thought! HaShem is Love (Deuteronomy 10:15)! He shows mercy to all (Numbers 14:18)! He remembers that we are but fallible beings formed of clay (Job 33:6)! It is not in His Sacred Nature to torment the weak and fallen (I Chronicles 16:34). The very notion violates Torah and everything we know about HaShem. The Hebrew word translated as fear is yir'ah. This is the feminine infinitive form of ya're and means "moral reverence." In other words we are to stand in awe and moral reverence before the glory of HaShem. Maintaining such adoration of Him we should never even consider disobeying His righteous commandments. Not because we are "afraid" of what He might do to us, but because of our love and admiration of His goodness and the rightness of His instructions. If we know that a given thing is His Will we should also know that it is for our very best. As Rebbe Nachman of Breslov teaches: Always remember: happiness is not a side matter in your spiritual journey - it is essential. HaShem desires our joy and well being. One who lives in a state of terror and dread of a vengeful tormenting G-d could never experience this! One might obey outwardly, out of fear, but one could never love, honor and adore such a terrifying deity! One could never serve such a G-d with joy and happiness and thanksgiving. The dogma of Hell drives people away from Love, it does not draw them to He Who alone is LOVE! Such fear alters our perception of His very nature and that nature is one of Justice AND Compassion.. There are a few verses that appear, out of context, to support the existence of this dreadful place of after-life torment. This is true and should be acknowledged. However we are told to "rightly divide the Word of truth" (II Timothy 2:15) and to prayerfully reason (Isaiah 1:18) in order to determine the realities being expressed in such passages. As Jews we also seek the wisdom of our sages of course. When we seek the truth by getting the overall picture presented throughout the Tanach we discover that the G-d of Love and Mercy presented in the Bible would never torture people! So where did the teaching of "Hellfire and damnation" come from? Circa 325 CE the Nicene Creed was ratified and established as the official doctrinal foundation of the new Catholic (Latin for "universal") religion of Constantine and his Roman Pagan associates. It remains a fundamental dogma in most of the Christian world. Its essential thesis is the rejection of monotheism (the absolute oneness of G-d proclaimed in the Tanach). Regardless of how the Nicene Trinity dogma is presented it is polytheism and the rejection of biblical monotheism. The Judaism of Jesus and his disciples was co-opted and was, at the latest, replaced by the year 325 CE. Yeshua's Jewish reform movement ceased to exist at least by that point and was formally replaced by those "who say they are Jews but are not" (Revelation 2:9, 3:9). The early "church fathers" established a global political and religious system of authority through which they could control every aspect of human life on Earth. As a direct result the western world entered into the "Dark Ages" (5th to 15th centuries CE). Whatever their motives may have been, the Vatican created the dogma of eternal torture as a powerful stick to wield against its opponents. The Catholic bishops consolidated, redefined, and unified the religions and beliefs of the Roman Empire into a new universal ("catholic") Magisterium. As part of this globalist process the standard Pagan teachings about Hades and his underworld realm were assimilated. The imagery of the Nicene Hell was mainly taken from the underworld abode of the god Hades and his part time lover Persephone. According to this belief there is a literal place, often said to be in the center of the earth, known as Hades, the abode of the dead and their god Hades. This became the subterranean world of eternal fiery torment known as Hell in Christian dogma and its god became the Christian Satan. Never mind that the dogma has no biblical basis nor traditional standing, the Magisterium of the Church declared it exists and questioning them in anything resulted in excommunication or often worse. In time the belief became dogma and was seldom if ever questioned again. The Magisterium proclaimed that the good news was that "the Church" had the power to ransom the devout from the flames and torture decreed by G-d! The threat of eternal damnation made their subjects docile and the collection plates rang with tithes, offerings and indulgences as sincere deceived people sold their souls and their lives seeking to purchase salvation from the Mother Church. Present day Nicene Christians vary on why people go to Hell, where it is, and how it can be avoided. Some teach that the "lost" are condemned to Hell because they fail to make the one decision necessary to achieve salvation: they refuse to accept the death, burial and resurrection of Jesus as taught by the Church. Others teach that if ones good deeds do not outweigh the negatives one goes there. Calvinist Christians believe people have no choice in the matter at all. They say that the G-d of love and justice created most human beings as fodder for Hell and only a few will be allowed to enter "Heaven" no matter how they live or what they believe. Everything is predestined they say. The Catholic and Orthodox Christian churches continue to teach that church membership is the only road to salvation. Pay your tithes, obey the Church and they will grant you an escape. Catholicism unapologetically proclaims: Extra Ecclesiam nulla salus: "Outside the Church there is no salvation." And by the Church they mean their own sect. Everyone else will be tortured by G-d for eternity! Most Nicene Christians are quick to point out that Hell is not something "G-d does to us," it is something we do to ourselves (although how one might do that even before conception in the case of the Calvinists is difficult to grasp given their firm rejection of reincarnation!). Friends, there is nothing just nor loving about this doctrine nor about a G-d who would create billions of beings solely to torture them throughout eternity. This is NOT the G-d of the Bible! There is no biblical basis for this teaching. HaShem can do anything and He could easily make another option for those who do not accept His alleged way of salvation. Therefore if Hell existed it would be G-d sending people there (G-d forbid). Such a thing violates everything we know about Him. There is no evidence that anyone from the Abrahamic traditions living in the first century C.E. conceived of such a post-life horror. Many Pagans did believe in such horrors then and now and the Jews rightly viewed them as savages because of it. Not a single person in the Gospel accounts ever challenged Jesus as to the origins of this non-Jewish teaching he allegedly taught. Surely some rabbi would have questioned it had Jesus actually taught it. The doctrine directly challenges the biblical assurances that G-d is Loving and Just (examples: Deuteronomy 32:4; Romans 2:24). Most "Bible believing Christians" believe many unbiblical and even anti-biblical teachings. The wide acceptance of such beliefs within Christendom do not make them biblical. The Greek word hades is in the Christian New Testament eleven times. In ten of those cases it is translated as "hell" and once as "grave" in the King James Version. That doesn't sound very biblical does it? And yet Jesus was a Jew who came to call his fellow Jews back to the Written Torah and faith in HaShem according to the New Testament. Are we supposed to believe that he taught them to believe in the Greek myths? G-d forbid. He never taught such a thing. Word Origin: Greek, Verb from Tartaros (the deepest abyss of Hades) the name of the subterranean region, doleful and dark, regarded by the ancient Greeks as the abode of the wicked dead, where they suffer punishment for their evil deeds; to be trust down to Tartarus, to hold captive in Tartarus." By far the most common word translated as "hell" in the Bible is Gehenna. II Chronicles 28:1 Achaz was twenty years old when he began his reign, and he ruled sixteen years in Yerushalayim [Jerusalem]. But he did not do what was right from the perspective of HaShem, as David his ancestor had done. 2 Rather, he lived in the manner of the kings of Y'israel and made cast metal images for the ba'alim [i.e. the Pagan demigods or "masters" such as Hubal-Sin, the god of Islam]. 3 Moreover, he made offerings in the Ben-Hinnom Valley [i.e. 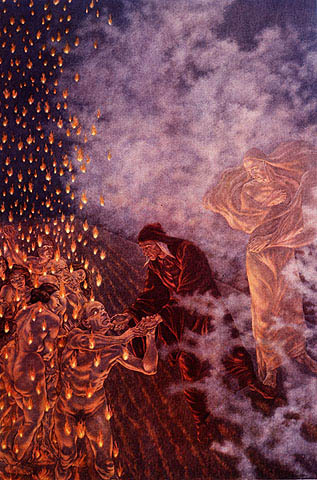 the Valley of Gehenna] and even burned up his own children as sacrifices, in keeping with the horrible practices of the pagans, whom HaShem had thrown out ahead of the people of Y'israel. KJV: Matthew 5:29 And if thy right eye offend thee, pluck it out, and cast it from thee: for it is profitable for thee that one of thy members should perish, and not that thy whole body should be cast into hell [i.e. Gehenna]. 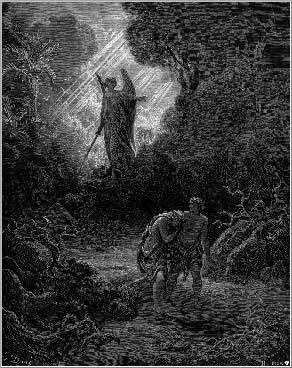 KJV: Luke 12:5 But I will forewarn you whom ye shall fear: Fear him, which after he hath killed hath power to cast into hell [i.e. Gehenna]; yea, I say unto you, Fear him. KJV: Luke 17:2 It were better for him that a millstone were hanged about his neck, and he cast into the sea, than that he should offend one of these little ones. Matthew 13:34 All these things Yeshua said to the crowds in parables; indeed, he said nothing to them without using a parable. While according to the New Testament Jesus frequently debated with the rabbis, he focused his teachings on the common people he met. He obviously wanted to make his teachings clearly understood and relevant to their daily lives. He knew that the people of Jerusalem routinely carried their trash to the dump, a huge pit kept burning with fire and brimstone. The flames and the stench of the place were at times almost overwhelming. The city people viscerally understood that were a person to be thrown into those flames there would be no hope of survival! The very thought of it made one shutter. For this reason his analogy of Gehenna was well understood. A person 'cast' in there would have no hope of redemption. They understood him perfectly, however the bishops made what was clearly intended figuratively appear to be literal. In the exact same way those who spent their time in little boats on the unpredictable and often violent seas understood well that if a heavy millstone stone were tied about ones neck and one were cast into the sea, there would be absolutely no hope of escape. Hence he used that example with them. In modern parlance one might say that those who reject HaShem might as well be thrown into a garbage compactor and crushed or given a lethal injection of some death row toxin! This is what he was conveying with these analogies and this is clearly what his hearers understood. The other word translated as Hell in the Bible is the Hebrew word Sheol. Ecclesiastes 9:5 For the living know that they will die, but the dead know nothing; there is no longer any reward for them, because all memory of them is lost. 6 What they loved, what they hated and what they envied all disappeared long ago, and they no longer have a share in anything done under the sun. In Sheol, the grave, there is no torture, no punishment, no horror... there is merely "sleep" while a person awaits their next life or the resurrection of the dead in the Olam Haba. Does the G-d of Israel torture people in the afterlife? The Sadducees were not even convinced the Torah taught an afterlife (Matthew 22:23), and the Pharisees (including Jesus) had no concept of any afterlife torture according to the records we have! The very idea of G-d as torturer is completely foreign to first century Jewish religion and thought. The Pharisees (rabbis) believed in the resurrection of the dead in a general sense, but did not have much established doctrine on it. We know that they did not believe in Hell as conceived by the Paganized Church. Such horrors were believed by the Pagans however and that's where the Vatican counsels got the idea! Exodus 32:32 And Moses returned to the Lord and said: "Please! This people has committed a grave sin. They have made themselves a G-d of gold. 32:32 And now, if You forgive their sin But if not, erase me now from Your book, which You have written." 32:33 And the Lord said to Moses: "Whoever has sinned against Me, him I will erase from My book!" Biblical religion is completely rational and fair. NO ONE can atone for the sins of another and the Torah rejects the idea of human sacrifices.